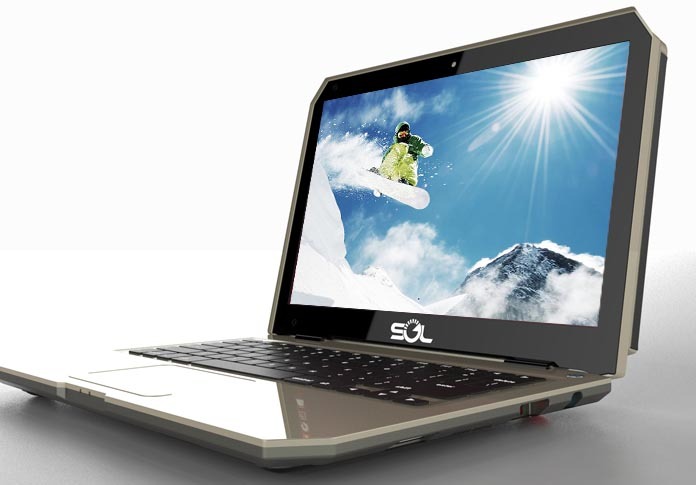 WeWi, A telecommunication Inc. located in Canada released new and fully solar powered laptop. The laptop recently available soon for buy, the laptop currently listed on its official website. It is the first laptop work fully with solar power. The company demanded 350 US dollars for the laptop. SOL fully designed for outdoor uses and military purposes. The device built-in with a high performance battery that gives about 8 to 10 hours operating time, solar energy is the source to charge the battery and it takes less than 2 hours to charge the battery. SOL comes with a 13.3 Inch LCD WXGA display with 1366 x 768 pixels screen resolution and the device powered by a 1.8 GHz Intel Atom dual core D2500 processor that mounted on 945GSE + ICH7M chipset. Kingston 2 or 4 GB DDR3 SDRAM included along with built-in Intel GMA3600 Graphics processor that features 1080p HD Video playback and super visual quality. SOL’s storage needs are managed by 320 GB Seagate 2.5 inch SATA hard disk drive. The device loaded with Ubuntu 12.10 operating system. The device sports a 3.0 mega pixel front camera, 3x USB 2.0 ports, built-in dual speakers, Internal MIC, 3.5 mm Audio jack, HDMI, and a multi Card reader (MMC/MS/SD). SOL features connectivity options via Wi-Fi (802.11b/gn), LAN (10/100), Bluetooth (4.0), 3xUSB (2.0), HDMI, Audio Jack, and GPS. The device has 5.02 lbs. weight and available in 5 color variants.